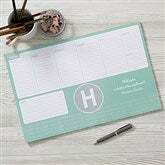 Single 52-sheet weekly calendar pad measures 11" x 17". 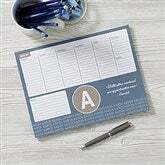 Keep everything neat and organized from week to week with our Sophisticated Quotes Personalized Weekly Planner! Each weekly planner calendar pad is available in your choice of 6 colors. We feature any initial in the center with any name repeating across the bottom. Select one of 34 popular quotes to provide daily inspiration or write your own to make it truly unique! A creative and useful gift for anyone on your list!